Dr. Nancy Schneeloch-Bingham teaches flute and directs the flute ensemble at Appalachian State University's Hayes School of Music. Her performance experience is diverse—she is a member of ASU's faculty woodwind quintet, and Harmonia Baroque, an early music ensemble featuring period instruments. Her duo with flutist Leslie Marrs, Dúo Pelirroja, tours annually and presents dynamic, team-taught masterclasses. Dr. Schneeloch-Bingham has performed with the Western Piedmont Symphony, Salisbury Symphony, Tallahassee Symphony, Winston-Salem Symphony, Kingsport Symphony, North Carolina Symphony, and Appalachian Philharmonia. Adding to her eclectic tastes in fluting, she is an accomplished player in the Irish traditional flute style, and is a founding member of the Irish music band, Sunday's Well. She is also a faculty member and Associate Director for the Hayes School of Music's study abroad program in Irish traditional music. An active recitalist and clinician, Dr. Schneeloch-Bingham has performed at the National Flute Association's annual conventions, and currently serves on the NFA's Historical Flutes Committee. 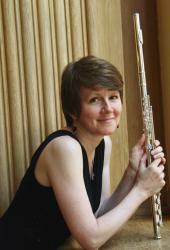 She also directs the NFA's Baroque Flute Artist Competition and Masterclass. Regionally, she is an advisory board member of the Raleigh Area Flute Association, and has presented workshops at their annual Flute Fairs. Dr. Schneeloch-Bingham also teaches and coaches chamber music at Cannon Music Camp, a comprehensive summer music program on the Appalachian State Campus.